A Hanukkah specialty that can be enjoyed all year round. Try adding some grated sweet potato to the potatoes to give color and added nutrition to these festive pancakes. Peel the potatoes and grate them coarsely by hand or in a food processor. Put them in a bowl of water as you work to prevent blackening. Drain and squeeze all the liquid from the potatoes. Transfer the grated potatoes and onion to a bowl and add the eggs, flour, salt and pepper. Mix well. To a large skillet, add oil to a depth of 1/4 inch. Heat oil on medium-high heat. When the oil is hot, add the batter by heaping tablespoonfuls, or even more depending on how big you like your pancakes. Cook until golden, about 3-5 minutes per side depending on the thickness. Flip and cook for another 3-5 minutes. Repeat with remaining batter, adding more oil as needed. Remove latkes to a plate lined with paper towels to absorb excess oil. Repeat with remaining batter. Keep warm in a low temperature (300oF) preheated oven, or, if made in advance, reheat in one layer at 400oF. 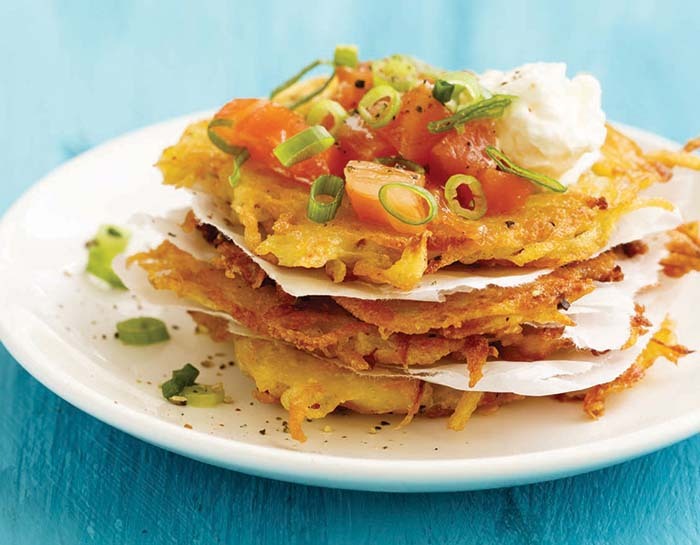 Variation: Make smaller latkes for a tasty hors d'oeuvre served with Crème Fraîche and smoked salmon. Credit: This recipe is from "Panache - Montreal's flair for kosher cooking" created by The Auxiliary of the Sir Mortimer B. Davis Jewish General Hospital.